Recently a cousin of mine, Amy Gigliotti, took up the hobby of colorizing old photographs. She kindly agreed to work on John C. H. Grabill’s photograph, “The Fighting 7th Officers.” After three weeks of diligence and painstaking detail, Amy graciously provided me with the below copy of Grabill’s iconic picture of the officers of the 7th U.S. Cavalry Regiment at Pine Ridge, January 1891, and I’m proud to add it to this blog. Click on the photograph for a more detailed view of the picture. When seen at full size the detail of each officer’s face is extraordinary, and the color really brings them to life. Colonel James William Forsyth and Major Samuel Marmaduke Whitside are shown above in full color. Again, click the photograph for a more detailed view. As one historian noted after viewing this colorized version, “They look old. In a tired way.” Forsyth was fifty-six and Whitside had just turned fifty-two. 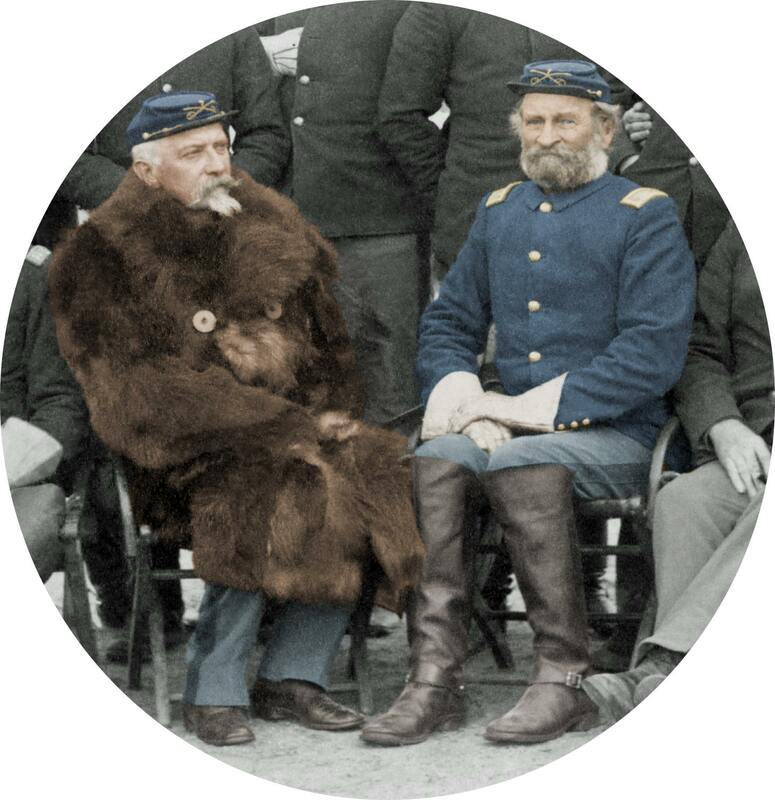 All of the Army’s field grade officers in 1890–major through colonel–were Civil War veterans and in their fifties. Forsyth still had the Wounded Knee investigation hanging over his head and was still relieved of his command. Whitside was commanding the regiment camped on a hill overlooking the agency with about 6,000 Lakota camped in and around the agency and no one quite sure if they would surrender, flee, or attack. Both men were under great stress at the time of this photograph. As one reader pointed out, Captain Edward Settle Godfrey’s face demonstrates what many would describe as a 1,000-yard stare, indicative of the horrors of war that this officer had experienced during two decades in the 7th U.S. Cavalry. Source: John C. H. Grabill, photo., “Fighting 7th Officers,” Library of Congress, LC-DIG-ppmsc-02563, (http://www.loc.gov/pictures/resource/ppmsc.02563/) accessed 16 Sep 2013. 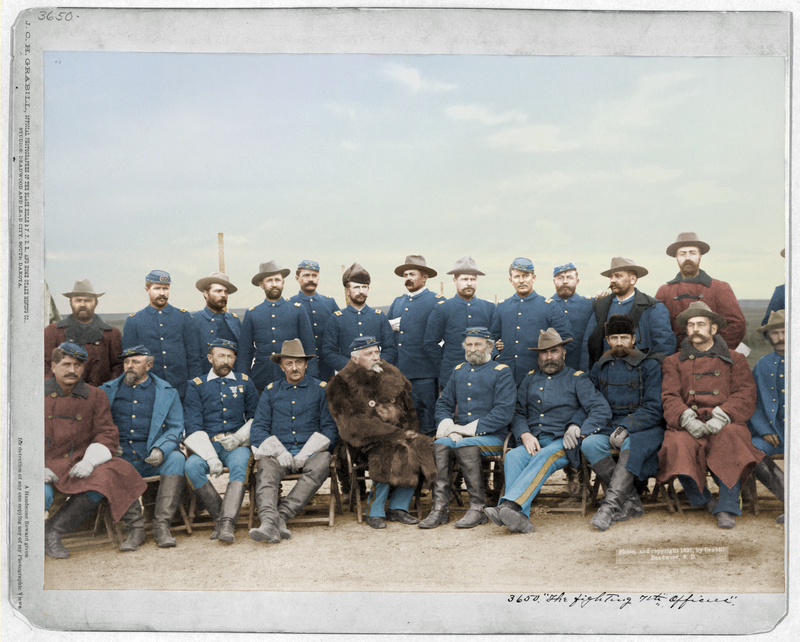 The photograph is labeled “The Fighting 7th Officers, by John C. H. Grabill, Official Photographer of the Black Hills & F. P. R. R., and Home Stake Mining Co., Studios: Deadwood and Lead City, South Dakota.” Colorized by Amy Gigliotti of Fullerton, CA, 13 Jun 2015. 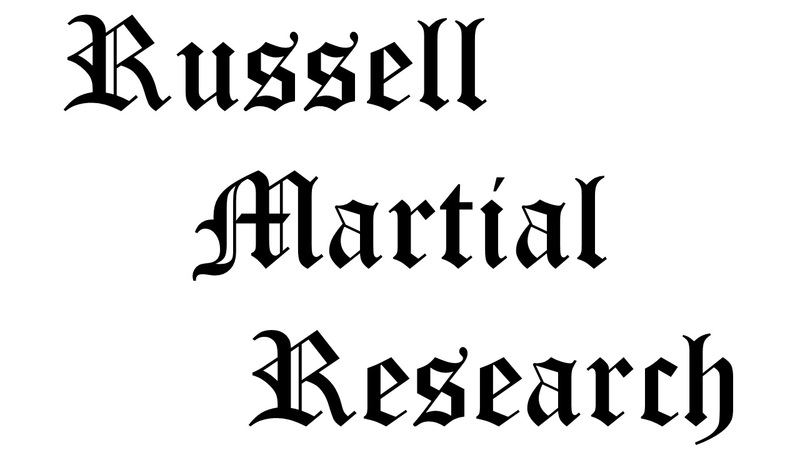 Citation for this article: Samuel L. Russell, “Grabill’s Fighting 7th Officers in Color,” Army at Wounded Knee (Sumter, SC: Russell Martial Research, 2013-2015, http://wp.me/p3NoJy-KR) updated 19 Jun 2015, accessed date __________. This entry was posted in Officers and tagged 1891, 7th Cavalry, 7th Cavalry Regiment (United States), Cavalry, Forsyth, whitside, Wounded Knee, Wounded Knee Creek, Wounded Knee Massacre. Bookmark the permalink. Well done!! These look fantastic! I’m glad you thought about having them colorized. Hi Sam— I love the colorizing here, as it is near perfect. I should point out that the officers top and bottom at the extreme left, as well as the top and bottom pair on the extreme right (and not counting the two men who are just partly showing) are wearing the blanket-lined canvas overcoat adopted in 1883 because of the depletion of the buffalo. While the collars (showing the blanket linings) are indeed jet black (close enough here—they look fine), the heavy canvas outers of each of the four (not counting the buttons or frogging, which are correctly black) should be brown, and actually a slightly rose-colored brown. These are extremely rare overcoats. I’ve seen only two in thirty years, one of which I owned, and which was in beautiful condition. The other was (and hopefully is yet) exhibited in the Quartermaster Museum at Fort Lee. Your cousin did a beautiful job on this. I don’t know if it is possible to change the color of those four coats or not, or even it you’d want to, but I wanted to let you know. It is a striking group, isn’t it? Jerry… Great feedback. I will pass on your comments to Amy, as I’m sure she’ll want to adjust to the correct hues. She did quite a bit of research to get the detail correct, and your feedback will go far in getting the color as historically accurate as possible. I certainly want to depict Capt. Edgerly, Capt. Hoff, Lieut McCormick and Dr. LeMay in the properly colored overcoats. Your feedback is welcome and greatly appreciated. Great photos in color, brings it all to life so much . While I am not a big fan of colorizing photos, this is indeed a nice piece of work.. I am particularly struck by Capt. Godfrey’s expression, seeming to exhibit what I’ve read termed “the thousand yard stare”, what today would likely be deemed a symptom of PTSD. At the time of this photo Godfrey was a veteran of thirty years’ service, participating in the Seventh’s major Indian battles: Washita (1868) Yellowstone fights (1873) Little Big Horn (1876) Bear Paw Mtn. (1877 where he was wounded and later awarded the MOH) and of course, Wounded Knee and Drexel Mission (1890). Godfrey’s conduct at WK would come under scrutiny and delay his promotion to Brigadier; President Roosevelt reluctant to promote him due to said conduct. To add injury to insult, Godfrey was injured in a train wreck in Kansas returning from the Pine Ridge campaign. He recovered to serve in the Span-Am War and finally a relenting Teddy Roosevelt allowed him his star in 1907. Excellent blog, Col. Russel, sir! Lots of material for those of us interested in the Seventh Cavalry, AC (After Custer). BTW I love the life sized mannequin of your great-great grandpa at the Ft. Huachuca museum! Steve… Thanks for the comment and details on Godfrey. I have at least four posts dedicated to this extraordinary officer. 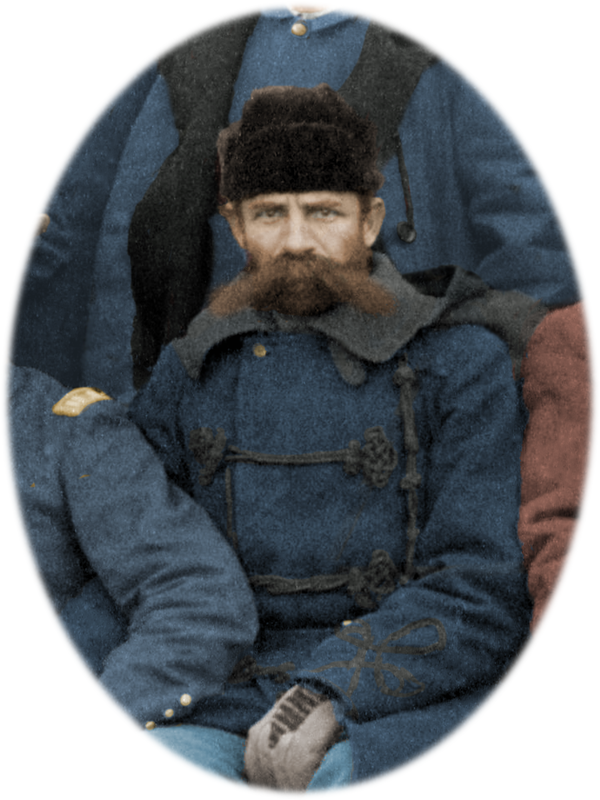 This colorized pictures exposes officers of the 7th Cavalry regiment ( to be honest, I prefer US Army uniform at this time, its was more elegant for me). But now, I know that there are 23 officers in a regiment. However, many western movies, with John Wayne, for instance, don’t show cavalry soldiers correctly, with yellow ribbons and white suspenders, oddly :/. Any idea why ? Thank you in advance for your answer.